Sahib and the Crew Save the World: Freeze, Or I'll Trim Your Bangs! "In most cases, there is no pattern or method to their selection of victims"
This of course is patently false. There is an easily discernible pattern to active shooter situations....they almost always occur in areas where responsible citizens are prohibited from carrying defensive firearms, ie "Gun-Free Zones". I prefer the more accurate "Target-Rich Environments". "you might consider trying to overpower the shooter with whatever means are available"
As the narrator intones these words in his best "I'm from the government and I'm here to help" voice, the video shows someone reaching into their waistband to draw their defensive handgun....no wait, that's not right. It actually shows the individual reaching into a desk drawer and pulling out........scissors. Freeze scumbag, or I'll trim your bangs! "officers may arrive in teams, with tactical equipment such as vests, helmets, and rifles. You know, all the stuff they don't want YOU to have to defend yourself. Here's the kicker, on June 7 of last year, the DHS released a Request for Proposal (RFP) to purchase 7,000 "personal defense weapons suitable for close quarters". 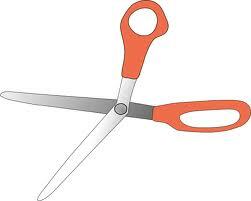 After watching their video, I assumed the RFP was for a buttload of pinking shears. Not exactly. Black rifles chambered in 5.56 NATO, capable of utilizing 30 round magazines, but NOT capable of automatic fire are "weapons of war" and must be kept out of the people's hands according to Dear Leader, Dianne Feinstein, and the rest of their merry band of gun control moonbats. 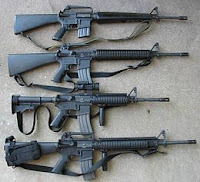 Black rifles chambered in 5.56 NATO, capable of utilizing 30 round magazines, and that ARE capable of automatic fire are "personal defense weapons suitable for close quarters" according to Janet Napolitano and the DHS.